Its all set and done - Brock Lesnar will defend his Universal title against Seth Rollins in the main event of WrestleMania 35. With Lesnar being ready to get back to fight at UFC, one would assume Seth Rollins will dethrone the Beast for good. However, if WWE has thought us one thing, it is never to trust them regarding Lesnar's booking. Roman Reigns was heavily speculated to win his title match against Lesnar at WrestleMania 34. However, Lesnar ended the night standing tall. It took Reigns another four months to finally get his hands on the big red belt. Similarly, when Braun Strowman was the obvious choice to win the Universal title at WWE Crown Jewel, WWE threw yet another curve ball, and had Lesnar win it instead. 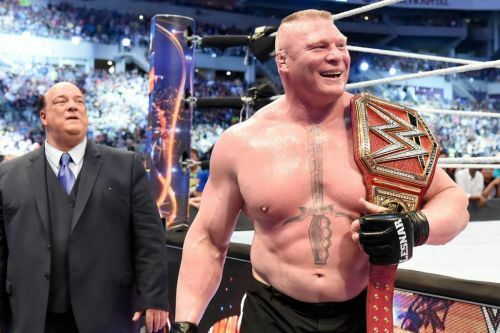 The point is, we can never predict what will happen with Lesnar's reign. He may drop it at WrestleMania - he may not. After all, the Beast has a good chance to hold both Universal title and UFC heavyweight title at the same time if things go according to his plans. This thread will focus on a few reasons why Lesnar should drop the title to Seth Rollins at WrestleMania 35. Lets kick off the list with the most apparent reason. We haven't been seeing the Universal title regularly ever since Brock Lesnar won it for the second time. Without the top belt on the show, RAW has been awful whenever Lesnar is off screen. The biggest reason why some of the recent RAW episodes have been good is that there was a Universal title storyline going on. This absence has to end, as Seth Rollins is a full-time wrestler, and appears on every RAW episode.